1I. Gravalos (e-mail: grabalos@ceid.upatras.gr) and A. Siokis are with the Computer Engineering and Informatics Department, University of Patras, Patras, Greece. 2A. Siokis, P. Kokkinos, and E. A. Varvarigos are with the Computer Technology Institute and Press “Diophantus,” Patras, Greece. 3E. A. Varvarigos is also with the School of Electrical and Computer Engineering, National Technical University of Athens, Athens, Greece. 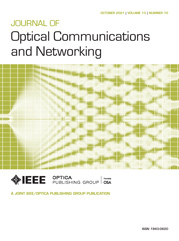 Optical interconnection networks are being used in systems on chip, supercomputers, and datacenters, fueling exascale computing, big data, and artificial intelligence applications. The vertical cavity surface emitting laser (VCSEL) is a popular, mature, and cost-effective photonic transmitter technology that enables energy proportionality by allowing the links’ data rate and the associated power consumption to be adjusted. Our work assumes VCSEL-based optical interconnects and presents intelligent centralized and distributed mechanisms to jointly and optimally select the routes, the flow sizes, and the transmission powers needed to serve a given input traffic load, minimize the consumed energy, and optimize performance. For this purpose, we use a detailed VCSEL energy model and formulate the energy minimization problem as a constrained nonlinear multicommodity optimization problem, which is solved optimally with the proposed approaches. The simulation results, carried out under a variety of scenarios, show the efficiency of these methods in terms of throughput and energy consumption.